Includes the names: Delia Sherman, Delia Sherman ed. The New York Review of SF readings for December 4 continue an annual tradition of having a family reading with Ellen Kushner and Delia Sherman, and Claire Wolf Smith as host. 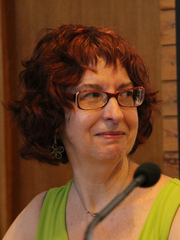 Delia writes and edits fantastic literature for adults and children, and has won a number of awards, including the Norton Award for her recent children’s novel, The Freedom Maze. Delia Sherman , The Magic Mirror of the Mermaid Queen. Delia Sherman's book Mad Hatters and March Hares was available from LibraryThing Early Reviewers. Delia Sherman's book The Freedom Maze was available from LibraryThing Early Reviewers. Delia Sherman's book Naked City was available from LibraryThing Early Reviewers. Delia Sherman's book Interfictions 2: An Anthology of Interstitial Writing was available from LibraryThing Early Reviewers. Delia Sherman is currently considered a "single author." If one or more works are by a distinct, homonymous authors, go ahead and split the author. Delia Sherman is composed of 3 names. You can examine and separate out names.